If “Ches” can win multiple events this weekend, how will he stack up against the all-time greats? Oregon’s Edward Cheserek is entered in four events at this weekend’s NCAA Indoor Championships. It’s not clear if he will run all four–he may or may not run on the distance medley–but it’s certainly starting some chatter. Changes in scheduling, especially at the NCAA Outdoor Championships, have renewed the significance of the single-day double (and even triple or quadruple). Being a history-minded guy, I decided to find out what some of the all-time great single-day efforts were in college track. Below is what I found. Owens’ one-day blockbuster in Ann Arbor has no parallel, not only in track and field but in any sport. It is the greatest single day performance in athletic history, superior to Wilt Chamberlain’s 100-point outburst or to the Redskins’ Sammy Baugh throwing four touchdown passes and adding an NFL record four interceptions in one game. Owens had fallen earlier in the week and injured his back, and his participation in the meet was unsure. He and coach Larry Snyder decided to take it one event at a time. 3:25pm: Owens took just one jump, a new world record of 26’ 8¼”. The distance stayed as the world record for 25 years, and stood as the Ohio State school record until Mike Hartfield broke it in 2011. Despite Owens’ best efforts, Ohio State came up 4½ points short of the team title to the host Wolverines. He put up several more big one-day efforts in 1935 and 1936, including a pair of quadruple victories at the NCAA Championships. Renaldo Nehemiah lacked a phone booth and a cape today. He wasn’t much slower than a speeding bullet, though, as he carried Maryland to three relay championships with as blazing a display of speed as the Penn Relays have ever seen. So wrote Robert Fachet for the Washington Post. “Skeets” started off the day with his only easy win, anchoring the shuttle hurdle relay. Back then they ran it on the infield astroturf and wet conditions made the time unimpressive…for Nehemiah. 13.3 was fast for any other collegian and still is. An hour later, Nehemiah’s last task of the day was anchoring the 4×400 relay. He was 25 meters behind Villanova’s Tim Dale and 20 behind Tennessee’s Antoine Blair. At the exchange, former Penn Athletic Director Fred Shabel said “He isn’t God — he can’t win this one.” Nehemiah himself said “I was kind of down when I got the stick. Both the Tennessee and Villanova anchors are capable of 45, so I just wanted to make it respectable.” Skeets got it close, and then took the lead off the final turn and brought home one last Championship of America trophy. His split was 44.3. A week later Nehemiah lowered his own 110 meter hurdles world record to 13.00, and another four weeks later he ran a wind-aided 12.91 at the NCAA Championships. De Grasse arrived at USC in the fall of 2014 as a little-known transfer from Coffeyville Community College. He’d only tried out for his high school track team with a month left in his senior year, but his talent was so obvious that local Toronto coach Tony Sharpe immediately took notice. His first big accomplishment was a runner-up finish in the 200 at the NCAA indoor, then made a bigger splash with a heavily wind-aided 9.87 at the Mt. SAC Relays. 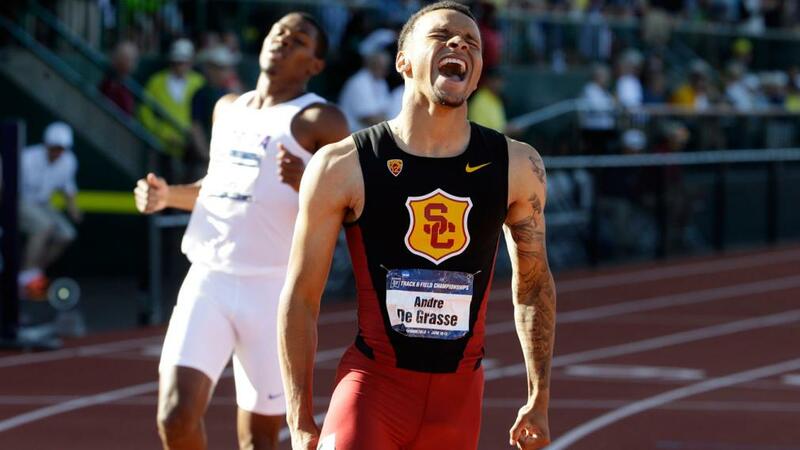 Two weeks later he helped his Trojans beat archrival UCLA for the first time since 2010 with a quadruple effort, and two weeks after that he won a Pac-12 triple in the 4×100, 100 (9.97) and 200 (20.05), very nearly becoming the first collegian to ever run sub-10.00 and sub-20.00 in a single day. It was at the NCAA Championships where he went nuts. The sprints were expected to be a showdown between De Grasse and Trayvon Bromell, the young Baylor star who had run several wind-aided sub-10 efforts. But the races weren’t close. De Grasse won the 100 by a massive 0.13 seconds with a wind-aided 9.75. The 200 was even more ridiculous; he led from the gun and ran a barely-wind-aided 19.58, the fastest time in Hayward Field history. If we use a standard calculator to factor out the wind, the times were equivalent to 9.87 and 19.72. Add in his second leg on the fourth-place 4×100 and it was the greatest one-day display of sprint power in college history. Thanks to TFN editor Garry Hill for reminding me of this one. Long-distance types like Rono rarely do big one-day doubles since their races are almost universally scheduled for different days. Rono was different than most, though. The Washington State star planned on a triple at the 1978 NCAA Outdoor Championships, and the schedule back in the men-only days of the 70s meant his qualifying heats in the steeplechase and 5000 were both on the meet’s opening day. Of course, he did it as only Rono would. What Rono did in his preliminary heats is more than what anyone, including Oregon’s Steve Prefontaine and WSU’s own Gerry Lindgren, could do in any NCAA Finals. His 8:18.63 in the first of three heats in the steeplechase was better than the meet record 8:24.86 by James Munyala of El Paso in 1976, and three seconds better than any American has ever run. His 13:21.79 time in the second of two 5000-meter heats also eclipsed the meet record of 13:31.4 by Prefontaine in 1972 and the [Hayward] Field record of 13:22.8 by Prefontaine, also in ’72. Cougar head coach John Chaplin “was resorting to every slowdown hand signal he could think of trying to attract Rono’s attention and let him know he didn’t have to go so fast” — but that was actually part of Rono’s plan. He had injured his foot while breaking the steeplechase world record the previous month, and the big effort in the heats was a test. Reports are that the four hours between heats was spent in his motel, taking a shower and a nap. 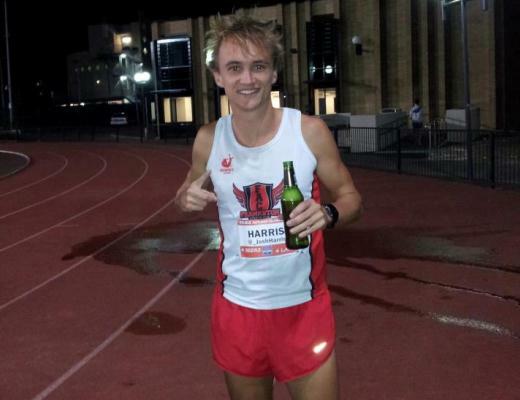 He followed up this devastating display with scratches out of Friday night’s 10,000 meters and Saturday’s 5,000 final, indicating how he felt (“I felt a little limpy”), but he did win the steeplechase on Saturday in another meet record time of 8:12.39. Nearly 40 years later, his 8:18 in the heats has never been beaten by any collegian save Rono. UCLA rode a 2-year win streak going into this meet and barely pulled it out. As you would expect, Prefontaine attempted to push his Ducks to victory by sheer force of will. He won the mile with 3:56.4 (”I hit the three quarters in 2:58 and said, ‘Oh well’, let’s pick it up. I felt good.”). Sixty-five minutes later came the 3-mile. “Pre wanted to get a good double,” said Duck head coach Bill Dellinger, “but I’m not sure if he knew how good the Kenyan was.” “The Kenyan” was Washington State freshman John Ngeno, the first Kenyan runner of any importance in the NCAA, who led the first two miles by as much as 25 yards. Pre’s strength pulled it out at the end for a 13:06.4 victory (roughly equal to 13:38 for 5k), capping what was then the greatest single-day distance double in world history. Gatlin only ran two years at Tennessee but was a great team player in that short time. At the 2002 Penn Relays, he ran on three winning relays in one afternoon (4×100, 4×200, shuttle hurdles) and tripled on the final day of the NCAA Championships (winning the 100 and 200 and running 44.7 on the 4×400 relay). His toughest assignment that year was at the SEC Championships, which may have been the second-greatest conference championship meet in collegiate history. He started off the day with a second-leg carry on the winning 4×100 (38.66), then battled NCAA hurdle champ Rod Bramlett all the way to the finish line (13.41). Yes, high hurdles; everyone forgets how good he was at that event, probably the second-best in the NCAA that year. Forty minutes after that he won the 100 in 10.11 (“I was a little tired…I just wanted to win and score points”). At the end of his quadruple effort in an hour and forty-five minutes came the 200, where he surprised even himself with a collegiate record 19.86. He might have been ready for the 4×400, but the Vols didn’t need him. Winning a distance double is tough, but it gets a lot tougher when the time between races is short. 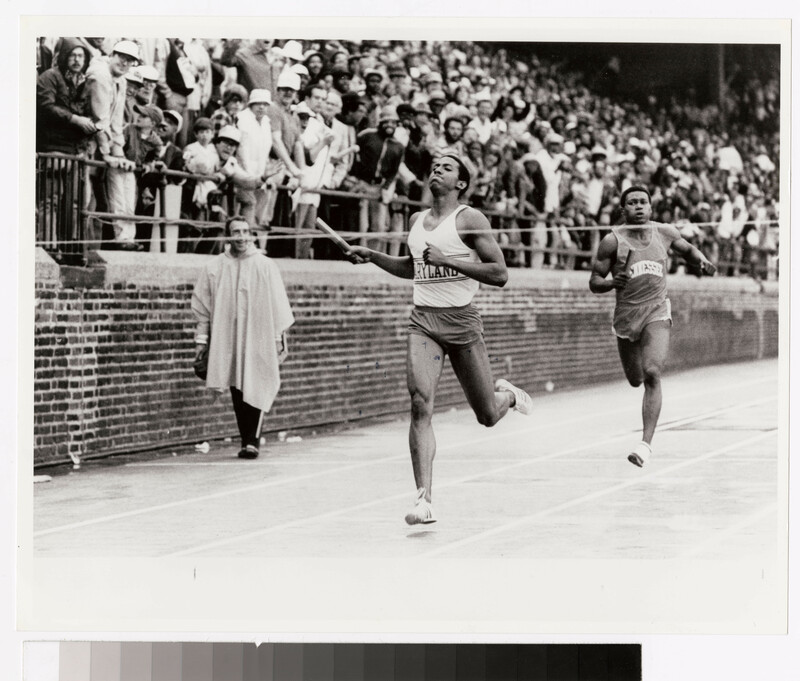 Don Paige had just 35 minutes between the 1500 and 800 at the 1979 NCAA Championships. It was the first time anyone had even tried the double since Ronnie Delany, a fellow Villanova Wildcat, pulled it off in 1958. Paige won the first event with extreme caution, not taking the lead until 60 meters to go and winning by just 0.07 seconds, 3:39.20 to Todd Harbour’s 3:39.27. With that race under his belt plus qualifying heats in the previous two days, the 800 was tricky. “The pain began when the gun went off and I had to sprint to that first flag and cut in,” he said. “That’s when I knew I was in trouble.” He was still just sixth at 600 meters, and had to swing out to lane three off the final turn to move up. He got to the front with 50 meters to go and edged away – and, surprisingly, ran a PR of 1:46.2. A surprisingly large number of athletes have won distance doubles at the NCAA Indoor Championships, but none have done it quite like Cheserek. Instead of a mile/2-mile or its metric equivalent, Cheserek won the 5000 and distance medley, and with an insanely short amount of rest. The relay started just 26 minutes after the 5000 finished, and Cheserek got the baton just a step behind Washington’s Izaic Yorks, a 3:53 miler, who proceeded to take the pace out hard. Ches stuck right with him until the final lap, when he took off and got the win. His split was 3:52.84 for 1600 meters, worth roughly 3:54 for a full mile (or 3:37 for 1500). The Ducks ended up winning the meet by 23 points, making Ches’ triple (he won the next day’s 3000) just showing off. Metcalfe won single-day doubles at the NCAA Championships for three consecutive years, and in two of them he put himself in the record books in both dashes. Well, sort, of; both in 1932 and 1933 he tied or broke official world records but for some unknown reason they were not submitted for ratification. Probably the better of the two came in 1933, where he won the 100 yards in a world-record tieing 9.4 (it was ratified as an American record), then won the 220 yards in another unratified world record of 20.4 (again, accepted as an American record). Despite two world records in one day, press reports of the meet did not highlight Metcalfe—possibly because the meet saw a total of six world records! As the star of a top-notch Midwestern team at a time when a great miler put thousands of butts in seats, Kansas’ Wes Santee ran a lot of doubles in relay and team competition. He had only one loss in his three years of running at the Texas, Kansas, and Drake Relays, and sometimes ran on four winning relays in one weekend. The best of his multi-efforts came in an April 1954 dual meet at Cal, a meet the Golden Bears were favored to win. 13,000 fans came out to see it, but Santee and the possibility of history’s first sub-4:00 mile were probably a bigger draw than the team battle. Santee opened up the meet with a 4:05.5 mile, a time no other American had ever beaten. 40 minutes later he won the 880 in 1:51.5 (with remarkable splits of 58.8 and 52.7), which made for the best 880/mile double in world history at the time. He still had another task in front of him since the meet was tied going into the mile relay. Santee ran the third leg in 48.0, handed off in the lead, and Kansas steamed home to win the relay and the meet. Matson twice set the world record in the shot put during his career at Texas A&M, but his best single-day double effort in the shot and discus was in an April 1967 triangular against Baylor and TCU. His distances were 70′ 5½” (21.47m) and 213′ 9″ (65.16m) – just 1¾” off his own shot put world record and 2½” off Ludvik Danek’s discus world record. As usual, Nyambui, a 22-to-28-year-old UTEP freshman from Tanzania, stood at the start wearing his deceptively sleepy expression, and, as usual, he started out way back in the pack. He hung there effortlessly on the 11-laps-to-the-mile track as if on automatic pilot, before moving into third place with three laps to go. Then, as he entered the last turn, Nyambui waved to his friends at trackside, flashed his gap-toothed grin and left almost all the other runners gasping far to the rear. His time of 8:37.87 was undistinguished, but it meant 10 more points for his team, and perhaps he had been saving himself for the mile. UTEP was the heavy pre-meet favorite and was piling up the points, and coach Ted Banks got Nyambui ready for another race. Nyambui was not the first man to win the mile/2-mile double at the NCAA Indoor Championships, but he was the first to do it in a single day. It looked like it put UTEP over the top for another team championship, but the Miners’ second-place 4×880 relay team was disqualified for interference and eight points were given back. Moments before the mile relay began, Villanova’s team learned that a win in that event would be enough to pip UTEP by a point—and that’s exactly what they did. Nyambui won the mile/2-mile double at the NCAA Indoor Championships two more times in three attempts, but this was his biggest effort and the most dramatic outcome. Gault is the only man to ever first man to win both the high hurdles and the flat sprint at the NCAA Championships, either indoors or out, and he did it on the remarkable turnaround of just ten minutes. He started off the double at the Pontiac Silverdome with an easy 6.98 win in the 60 yard hurdles (worth roughly 7.47 over 60 meters, whereas the collegiate record is 7.45). The flat 60 yards was a lot tougher; Gault got out of the blocks dead last and was still far back at 40 yards. Then he got into high gear and was among five men within a foot of each other at the finish. Officials took a long look at the finish photo before declaring Gault the winner in 6.18, the same time as runner-up Calvin Smith. As the greatest heptathlete of all time, you would expect that Jackie Joyner-Kersee would be a tremendous asset to a college team. She put together some huge efforts in dual meets; she once did all seven heptathlon events (for a 5671 score) plus a leg on the 4×100 all in less than three hours. Possibly her top collegiate effort was at the 1985 WCAA Championships (the California based women’s conference that predated women’s participation in the Pac-10). There she won the 100 hurdles (13.31, beating a freshman teammate named Gail Devers), the 400 hurdles (55.87, then #7 on the all-time US list), the long jump (21′ 11″), the triple jump (42′ 6¾” in just her second TJ competition ever), took third in the high jump (6′ ½”), fourth in the javelin (151′ 5″), and sixth in the shot put (48′ 2″), and ran on the winning 4×100 relay team. All in all she accounted for 53½ points. Carter was the first to even try a single-day NCAA Championships double in the 100 and 400 meters, and he managed to win them both. The 100 came first, where he ran from behind to upset defending champion Walter Dix and win in 10.09. Thirty-eight minutes later came the 400, where the “X-Man” was the clear favorite and once again he won it at the end, this time with an impressive 44.53. At the end of the meet he ran a third event, the 4×400, and the race was over when his LSU teammates gave him a lead at the final exchange. He ran a “comfortable” 45.5 leg and was never challenged. Add in the previous day’s 4×100 victory and he was the first since Owens to win four events at the NCAA Championships. 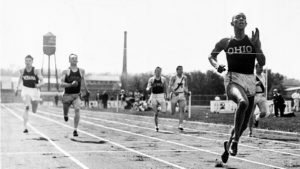 “Long” John Woodruff was an Olympic 800 meter champion while a college freshman, so he was already a world-class runner when he first used eligibility for the Pitt Panthers in 1937. He helped relay teams win doubles at Penn with regularity, running distances from 220 yards to 880 yards, and for three straight years he won a 440/880 double at the IC4A Championships. The last of those three, in 1939, was the most impressive; he tied the meet record in the quarter mile (47.0) and broke the meet record in the half mile (1:51.2). Prior to 1958, the only man who successfully pulled off an NCAA mile/880 double was Michigan’s Ross Hume in 1945, when the war effort significantly depleted the level of competition. Delaney had competition. He had been the Olympic 1500 champion two years earlier, so he was already a known quantity. In both races he stayed well back of the leaders and then made a late and successful rush for the lead. His winning times were 4:03.5 (a meet record) and 1:48.6. Both were very respectable times for the late 50s, and even more so since he had just an hour’s rest between them. Lofton put up possibly the biggest effort ever made in “The Big Meet”, as they call the annual Cal-Stanford clash. In 1978 he won the 100 (10.5 into a headwind), the 200 (20.5, still the meet record and the Stanford record), the long jump (25′ 7″ on just two jumps), and ran on both winning relays including a 45.9 carry on the 4×400. It was to no avail, as Cal won by a score of 86 to 68. Most of the athletes in this compilation went on to some level of greatness, but Edwards is one of the few who seemed to have peaked in collegiate competition. He was a holy terror in the USC-UCLA duals, which were some of the best (and certainly best-attended) meets of the 1970s. Before the 1978 meet he said “I’m not sure how I feel today. I don’t feel good, but I don’t feel bad.” He ran like he felt good and established two collegiate records. He anchored the 4×100 which won in a record 38.85, then won the 100 in 10.18, and topped it off with another collegiate record of 20.03 in the 200. Lewis only used two years of collegiate eligibility at the University of Houston, but in that time he made a big impact on the record book, especially at the Southwest Conference championships meets. At the 1981 indoor championships in Fort Worth on February 20, he won the 60 yards in 6.06 (worth roughly 6.48 for 60 meters) and smashed the world indoor long jump record with 27′ 10¼” (8.49), which is still the #2 indoor mark in collegiate history. At the outdoor championships in Dallas, he copped another “world record” with 10.00, the fastest ever at sea level. He also won the 200 (20.73), won the long jump with a single attempt (27′ ¾”), and ran a storming anchor in the 4×100 that brought his team up to second. Ritchie is without a doubt the best two-implement thrower in collegiate history. In the 1983 version of the annual Arizona-Arizona State-Northern Arizona triangular, she tied the collegiate shot put record on her first attempt (59′ 3″), broke it on her second (59′ 9″), and again on her third. The final result, 62′ 6¾” (18.99m), stood as the collegiate record for over 20 years. Her discus effort that day was only average by her standards, a 210′ 0″ throw (64.00m), but to date only four other collegians have ever thrown further. The UCLA vs USC dual meet rivalry is every bit as intense on the women’s side of the action as it is on the men’s side, and Devers almost won the 1986 edition all by herself. She won the 100 (11.41), 200 (23.38), 100 hurdles (13.30), and long jump (21′ 6¼”), took third in the triple jump (42′ 6¾”), and ran on both relays. The winner of the latter, the 4×400, determined the meet winner and Devers nearly won that one too. She anchored with 53.4, but it wasn’t enough to beat the Trojans, whose 3:32.58 was then the fastest ever recorded in a dual. Distance runners like Falcon were big parts of the Arkansas machine that churned out twelve straight NCAA Indoor Championships from 1984 to 1995. Coach John McDonnell admitted that Falcon’s double “gave us the championship, the team title. That’s for sure.” Not much else went right for the Razorbacks—they were expecting big points in the 4×800 and 800 but came away with nothing—and Falcon accounted for 20 of their 34 points, but it was enough to win. Villanova was a women’s distance powerhouse in the late 80s and early 90s, and Huber was one of the Wildcats’ biggest stars. The NCAA Indoor Championships are a meet with a condensed timeframe, so putting together a tough distance double was key to Villanova’s runner-up finish in 1988. The mile came first, and Huber was expected to do battle with Wisconsin’s Suzy Favor, but a stiff leg after the 4×800 relay took her out of the race. Still, Huber ran a fast race, then the third-fastest in collegiate history (4:31.46) to win by 50 meters. An hour later she came back for another win in the 3000, leading for the entire last 800 meters. Favor was a nine-time NCAA champion at Wisconsin, and on this day she won two of them. She was used to big workloads; “It’s not easy but it’s worth it,” she told the UPI’s Jim Slater. “You train for things like this. Big Tens was five races in two days so I should be ready. I’m anxious to be able to double and continue strong into the second race. I know I can get it done.” In the space of an hour she won the mile (4:38.19) and 3000 (9:02.30). Earlier that week she also got engaged to Mark Hamilton, a pitcher for the Wisconsin Badgers. Their relationship got a little weird in later years but appears to have survived. Lagat became just the third man to win a one-day NCAA indoor mile/3000 double (or its imperial equivalent, the 2-mile) and did it as you would expect him to have done it. He shadowed the leaders in the mile before zipping away with a 54-second final 400 for a 3:55.66 win. 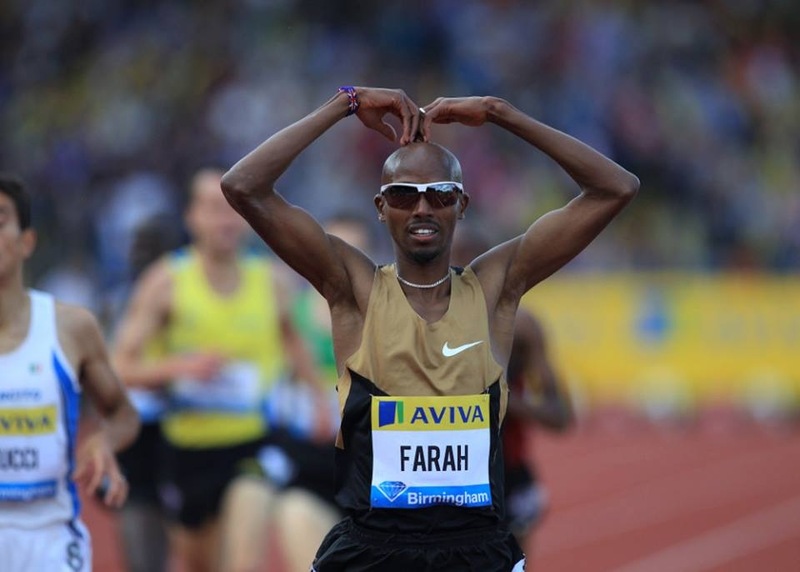 85 minutes later he ran the same strategy in the 3000, finishing with a 56-second 400 for another win in 7:54.92. Lassiter anchored three winning relays for his Arkansas Razorbacks at Penn, with two of them coming on the meet’s final day. His first win was a big one, anchoring the 4xmile relay with 3:55.6 and giving the Hogs the collegiate record to erase Oregon’s 37-year-old (!) standard. Three hours later he was back on the track to anchor the 4×800, where he got the baton clear of the field and his Razorbacks ran 7:13.87, the fastest time at Penn in fourteen years. The head coach of the UCLA Bruins in the 1990s and 00s was throws guru Art Venegas, and his most complete pupil was Seilala Sua. Winning four events in the UCLA-USC dual meet is a rare accomplishment, but winning all four throwing events is unique. Sua did it in 1999 with marks of 17.05 (shot), 60.96 (discus), 58.38 (hammer), and 46.92 (javelin). Michigan dominated the distance events at the 2005 Penn Relays with a rare triple-win, and all three wins included Brannen and Willis. The double effort was on Saturday. The first was the 4xmile, where Willis ran third leg in 3:56.2 and Brannen anchored in 3:59.4 to set a new collegiate record of 16:04.54. Three hours later they came back for the 4×800 and again dominated the field, with Willis running third leg (1:48.6) and Brannen running anchor (1:49.8). In an oddly tactical 5K that shifted be- tween dead sprints and almost complete stops, Rupp sat unrattled in 3rd most of the way before a decisive move with about three laps left gave him a 13:41.45 win, more than three seconds up on Liberty’s Sam Chelanga and Arkansas’s Shawn Forrest. Two hours later he was back in the DMR, showing no fatigue as he blasted away from Hog miler Dorian Ulrey and Cal’s Michael Coe with 300 meters left for a 9:29.59 victory. Thanks to Let’s Run’s Jonathan Gault for reminding me of this one. Lalang, the lanky junior from Kenya, set meet records in both the mile and the 3,000m in a span of one hour and 40 minutes…“So amazing, you know?” Lalang told reporters of running 3:54.74 in the mile followed by 7:45.94 in the 3,000m. A year later Lalang went for a triple in the mile, 3000, and 5000, but was not able to win either the 5000 on Friday (when Oregon freshman Edward Cheserek beat him) or the mile on Saturday (where he was outkicked by UTEP’s Anthony Rotich) and dropped out of the 3000. In the 3,000 meters, Lalang was mostly concerned about Texas Tech star Kennedy Kithuka, who won the 5,000m title on Friday. Kithuka was indeed the leader after the first kilometer (2:38-flat), and remained there until 1,600 meters when Lalang took over and kept the lead through 2,000m (5:15.47). At the bell, Lalang was boldly challenged by Northeastern’s Eric Jenkins and Oklahoma State’s Kirubel Erassa, who came up on his shoulder…Lalang ripped a 26.6-second final lap to put the race away and break Adam Goucher’s 1998 meet record of 7:46.03. It was no surprise that Lawson won the long jump on the opening day of the NCAA Championships, but two days later he was a surprise winner of the 100 in 10.22. Later in the afternoon he won again in the 200 (20.19), making him the first 100/200/long jump winner since Jesse Owens. He also added a leg on the third-place 4×100 relay to start off the day. Surprised that Jackie Joyner is not a finalist with the performances you noted in here… was it because it was only done in a dual meet setting and not on a championship level? The meet I referenced was the WCAA, a now-defunct women’s conference meet. Some of those marks are no longer elite, especially the shot put which would struggle to score at even some mid-major conference meets. But I originally had it in the top eight before juggling things around. If the track had nine lanes, she’d be in the final. Elite marks evolve over time. Jesse Owens no longer has the WR or even school records in those events where he did his 1 day quadruple, but it is still impressive none-the-less. I understand this is all subjective, but as a woman, I feel that there should be some kind of female representation, even though the opportunities for us have not been around for as long as the men. Just my thoughts. Agreed. One of the issues is that scheduling for women doesn’t tend to ask as difficult of doubles from women. The Penn Relays splits up the biggest relay events over three days, whereas they are concentrated into two for men. Clancy may very well have going on to post-collegiate greatness were it not for the Olympic boycott in 1980, and the lack of a modern post-collegiate professional support system in that era, but boy, did he have a great 1978! Still only one of two (?) men to win both the NCAA and AAU / TAC / USATF 100 and 200 championship doubles in the same year. Andrew Riley – University of Illinois – 100 and 110 hurdles at 2012 NCAA Championships. Not sure if it was on same day, but Willie Gault is not the only man to win hurdles and flat sprint. Thanks — I actually saw it in person and forgot about that. They were on separate days.